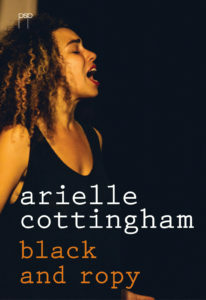 Afro-Latina poet, performance artist, and dancer Arielle Cottingham began performing spoken word in 2014 while studying abroad at the University of Melbourne. She returned to San Antonio, Texas to complete a Bachelor of Arts in eatre at Trinity University, during which time she became a regular performer at PuroSlam and e Blah Blah Blah Poetry Spot. In September 2015 she returned to Melbourne, where she found herself pursuing a career as a full-time, working performance poet and creative producer of Slamalamadingdong. She released her rst chapbook, e Tarantist’s Soapbox, in April 2016, and six months later she took rst place at the National Championship of the Australian Poetry Slam. She currently lives in San Antonio, Texas, where she continues to write and perform.